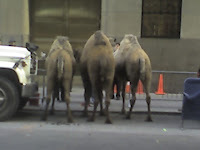 We can strive to lead lives filled with prayer, good deeds, and mystical experiences, but there is still nothing better than walking down a street in Manhattan at 8AM and seeing three camels parked on the sidewalk right between the cars. Oh my gosh- this is a hoot! Ha, if only I could instantaneously transport myself there!